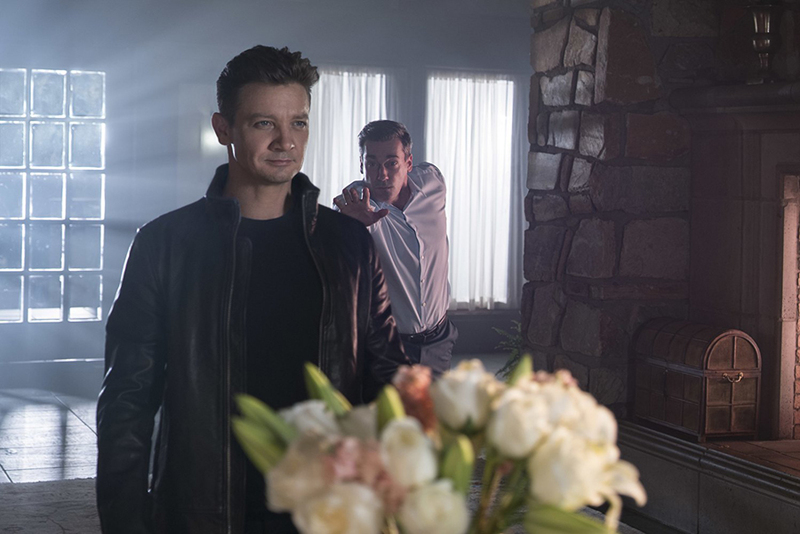 Jon Hamm and Jeremy Renner in TAG. Courtesy of Warner Brothers Pictures. Why did a Hollywood studio make a movie about the childhood classic game of tag? Because it would be awesome – that’s why. It may sound like a joke that a simple playground activity many of us participated in our youth, forms the base for a wholly cinematic, highly comedic and action-packed tale about friendship. However, director Jeff Tomsic’s TAG is actually based on one particular group of friends’ real life, decades long game they use to routinely stay in literal contact with each other. At the film’s recent press day, I spoke with the affable filmmaker about everything from the challenges of making a comedy on an action movie schedule, to meetings about thongs, to the importance of fitting in female roles. There were 30 years of tags to choose from and all were real. Was it difficult narrowing down which to use in the movie? One of the difficulties was talking to the real guys and getting the real truth outta them because they like to mythologize themselves just as much as we mythologize them in the movie. The level of fiction and reality was even difficult for me to discern. Some of it’s harder to believe than even the things in the movie. There are things that we kept out because they seemed too insane. The funny thing is they show up just to hang out with each other and they’ll simply tag and buy beers for each other. So some of it is not that extreme or amazing. Other times, it’s stuff like you see at the end of the movie where they’re dressed in the mascot costume, or as an old lady chasing each other down. One of their wives, by facilitating their tags, tore her ACL. One of the guys is a Catholic priest, he asks Mike’s wife, Jackie, to lure Mike out to the car to look at the stereo and had locked himself in the trunk. She didn’t know where he was hiding and he popped out and scared the bahjeesus out of her and fell backwards and tore her ACL. I’ve been emailing her a little bit – she’s still so pleased with herself that she made that tag happen even though she had a major injury. The frustrating thing is, now that we’ve finished the movie, I’m getting better stories than before. But it was hard. The truth is even stranger than fiction. Even the fact there’s a Catholic priest as part of this group is totally absurd. And he’s just as committed as anyone. I don’t know how he’s leaving his flock in Montana to do this. I guess, if you have the stamp of God on your side. The fun part is how you make these sequences outrageous, cinematic – and make them all look different. This must’ve been intense to choreograph, stunt coordinate and, later, edit all together. The struggle with a movie called TAG is just shooting guys just playing tag wouldn’t have lasted more than a few minutes. I really wanted to do two things: Show how, in this subjective reality of the tags, they really feel they’re superhuman and this incredible physically, which, of course, is not totally true. But also, to get us to a place where we realize what the stakes of this game are. Playing tag for the guys in the movie and in real life, doesn’t have much to do with winning or losing. There’s not really a way to win or lose – you’re just not “it.” It’s much more about if these guys are going to remain friends. Those stakes are so huge and possibly more important than defeating Thanos or some fictional, world-ending god in a superhero movie – at least to them. I just wanted to go as big as possible and reference movies where it’s a life and death struggle. I also love action movies, so it was fun to bring my favorite films into a movie called TAG. I love Guy Ritchie and what he’s done, making these incredibly cool sequences. Applying that to the game of tag seemed really silly to me –just to show how serious it was. I also wanted to map the tone of those tag sequences to the central characters within them. Chilly’s chase up and down the fire escape – he feels like an 80’s Walter Hill/ Martin Brest grizzly character. I wanted to get that feel and work with handheld and to feel like POINT BREAK, where he was almost so willing to hurt himself that he felt like he had a death wish. Imagine the worst version of Keanu Reeves in that where he’s just running into everything unnecessarily. We did a lot of pre-viz – a lot of storyboarding. My stunt coordinator, Eric Linden, we pre-viz’d all those scenes. We also didn’t have a big schedule like an action movie. We had to shoot these ten times faster than you would on an action movie. It was important to know every shot before you got there to execute the plan. We cut everything to music months before we had the actors. Eric and I have worked with each other for years and he’s such a good filmmaker himself and really funny. So a lot of those sequences, he would figure out how to switch the guys to “it,” or use the tablecloth in the tag. It was a real Rubik’s Cube, even choreographing. I personally appreciated that you fit in female characters where you could here. You gender-flipped the real Wall Street Journal journalist who discovered these guys. Anna (Isla Fisher) is perhaps more formidable than some of these guys. Susan (Leslie Bibb) isn’t a typical bridezilla shrew. Was all this always in the script or was that something you brought to it? Right. Which is something that happens a lot in scripts – especially when you have an ensemble. Some of the male characters vanish – they’re in scenes and don’t talk for 15 pages. Isla really pushed to create a character that’s that intense, but not just weird and crazy. It’s a fine line to walk. We tried to do stuff where it felt like she had a healthy sexual relationship with her husband and it was spicy, but it kept him focused. She was better and more committed to the game than the other guys. Yes. She’s got the fire. Yeah. Her capacity is better than any of them. Those two women’s commitment to being funny…because it’s scary to perform a character who doesn’t quite fit into what you’ve seen. I think they both found fresh stuff – particularly Leslie. To commit to the villainy of that character, to me, it’s so funny. It felt much better to me to have a movie that was inclusive – and not just from a gender perspective, honestly. The idea of the movie is for everybody. It’s about friendship. It’s not necessarily about male friendship. It happens to be a true story about a bunch of guys, but this is a universal idea. Also, the arc of the movie, wasn’t there in the beginning. But that was something we found while we were working on the script that I’m really happy about. You should take this and bring it into everyone’s friend group – male or female. 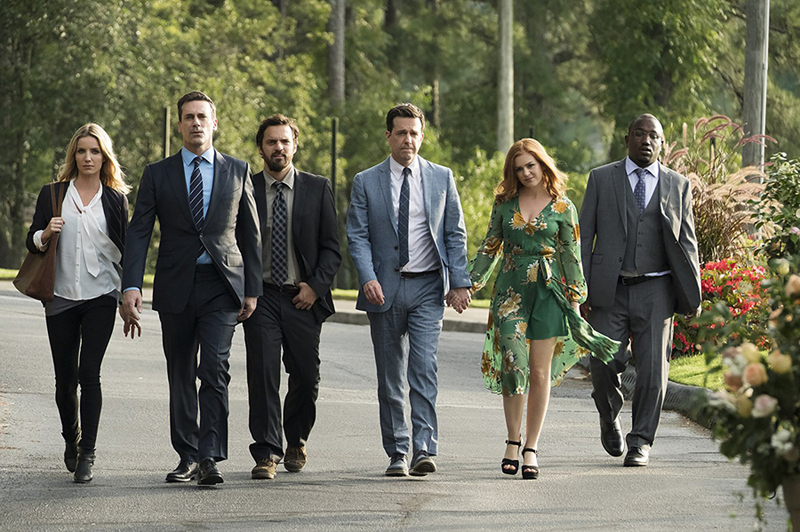 Isla Fisher, Jon Hamm, Ed Helms, Annabelle Wallis, Jake Johnson, and Hannibal Buress in TAG. Courtesy of Warner Brothers Pictures. How many donuts did you wind up hurling at Ed Helms’ face? [laughs] Jeremy threw so many donuts, but actually no real donuts ever touched Ed Helms’ face. It was not harmed in the making of this movie. Those are all CG donuts. Did you blow wind cannons on his face to simulate it? No. Ed’s face is just like a basset hound’s face. He says that about himself. We shot that stuff and watched it back and he’s like, “I’m just a human basset hound. I don’t know where all that flesh came from.” In real time, it looks so silly. He’s only taking like four steps and twisting his head. Brian Dennehy the actor is in this and one of the real guys this film is based on is also named Brian Dennehy. Is that a nod? It is… It’s difficult to say: It’s both a nod and I love Brian Dennehy the actor, but it became very confusing. We legally couldn’t use any of the real guys’ names in the movie. We got a very nervous phone call from the tag brother saying, “I heard Brian Dennehy is in the movie, but you can’t use my name.” It was like a “Who’s on first” sketch trying to explain this. Did you have meetings about the thong Hannibal Buress wears? [Laughs] There was a moment, at the end of shooting, where I walked up to the production office and Denise [Wingate] and Kate [Duke] in wardrobe had plastered 400 thongs all over my… It wasn’t a meeting. There were just thongs everywhere. There was a thong in the fridge. There was a thong in the freezer. Every drawer had a thong in it. My water bottle, I tried to put water in it – there was a leopard thong inside. They brought every form of male thong to set as possible. Jeremy Renner was hurt doing that stunt with the chairs. Did you keep that take in the movie? No. It’s not the take that’s in the movie, but the take where he got up after he hurt himself and wanted to do it again and that’s what’s in the movie. I had no idea he was injured in that moment. He had stumbled and messed up and wanted to look better. So he just jumped back up there and did it again – and that’s in the movie. He does have two broken arms while doing that. Was there ever a question to do goofs or outtakes at the end of the film versus what you do instead? I never wanted to do outtakes at the end of the movie, because I had seen it. It’s every comedy now. But it was a tricky choice because we, unlike most comedies, were ending on a very sentimental note. I wanted to do something silly that undercut this straight sap of who I am. Jeremy and I came up with that while hanging out much later. “It was so stupid. We have to do this.” And that was only a few weeks ago that we shot that. TAG opens on June 15.